PBL can align with CCSS when teachers, knowing their kids' interests and abilities, let projects evolve to meet student needs as well as the standards. 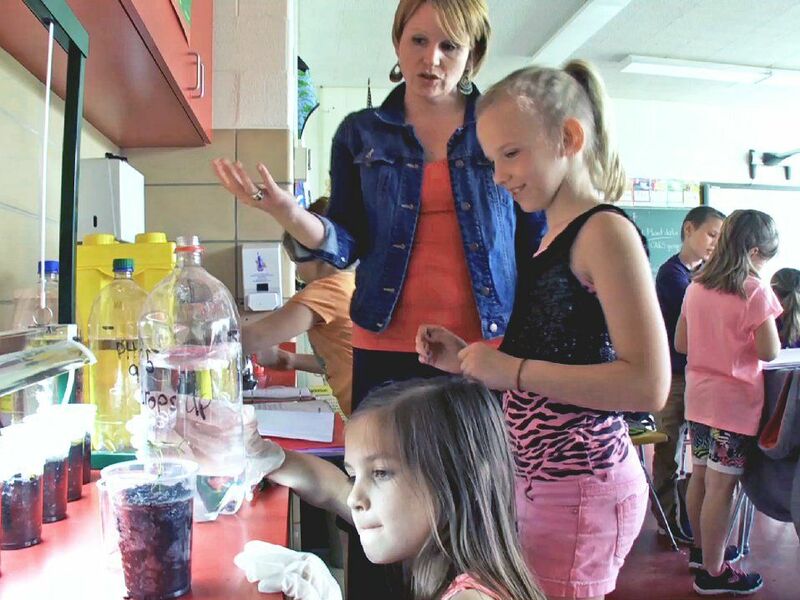 Fourth-grade teacher Carrie Hordubay talks to students about their plant experiments, designed to measure how variables such as music, pH, and light color impact plant growth. The emphasis of project-based learning is for students to explore real-world problems and acquire a deeper knowledge. As our teachers at Crellin Elementary plan their instruction, they refer to the Maryland Common Core Standards for guidance. These standards outline what we need to teach students, but they don't mandate how we have to teach. While research-based best practices are published and readily available, it's ultimately up to the teacher to decide, based on students' needs, the strategies that are appropriate. To accomplish this, Crellin follows a process that I will outline in this post. It is important to know the skills and processes that your students have already been exposed to, as well as the skills and processes that they'll be expected to have in the future. As a staff, we have studied the standards at each grade level to ensure that teachers are familiar not only with their particular grade level, but with vertical expectations as well. What is it that we need our students to know and be able to do before they leave our school? How will we know that students have those skills and processes? As we moved through the grade levels, we continually went back to be sure that we were setting our expectations high enough to prepare students. The conversations dug into the developmentally appropriate activities and instructional scaffolding that we would need. By understanding the big picture, teachers are able to plan instructional, authentic projects that build upon foundational skills and prepare students for subsequent learning. The projects that we delve into are student driven. The ideas stem from interests and questions posed by students and are most often place-based. Projects might address the animals in Sunshine Farm (our schoolyard agricultural project), a community concern, or an environmental issue. Once a project idea is proposed, we again look at the end that we have in mind, asking ourselves: "What is it that our students will learn and be able to do through their participation in this project?" We acknowledge that there will be teachable moments and unexpected events that may change our original course of action. The end product may be known -- it could be the construction of an animal playground for our farm animals -- or the project may be a study of a topic to determine the end product. Either way, the most important part is the process. Teachers think about the content subjects that can be woven into the project. Disciplinary literacy, writing to inform, math skills, presentation skills, technology skills, and content knowledge are subjects and skills that may be integrated. Content experts and Learning Partners may assist teachers in the sequential planning of content knowledge instruction. They ensure that the content information presented is factual. Teachers use their expertise in student development to match the content that needs to be taught with developmentally appropriate instructional strategies. As often as possible, the time frame is flexible. We allow the process and student need to guide the project plan and timeline. Knowing the big-picture objectives, teachers are free to allow for the unexpected and to make in-the-moment instructional decisions. (For example, when students are installing a new garden, it may become evident that additional instruction is needed in calculating area and perimeter). The projects are often works in progress that aren't always planned out completely before implementing. It's a kind of action research project, where students base their next steps on what they are learning through the process. As the project progresses, the teacher finds opportunities to ask questions that will deepen students' thinking, while also finding ways to connect previous or new knowledge and skills. Students are expected to share their learning. They share their experiences and understandings through written publications, videos, or presentations to interested community groups. Through this approach, students are engaging in critical thinking and problem-solving activities that embellish their understandings. It's not about reiterating what they read in a book or acquiring isolated facts or knowledge. It's about learning for a reason and applying that learning to a new situation. These projects require students to cross disciplines, weaving their understandings together to complete the task. This is when connections are made. This is when real learning occurs. How do you align PBL projects with the standards? Demographic data is from the 2014-15 academic year. Fiscal data is from the 2013-14 academic year. This blog post is part of our Schools That Work series, which features key practices from Crellin Elementary.